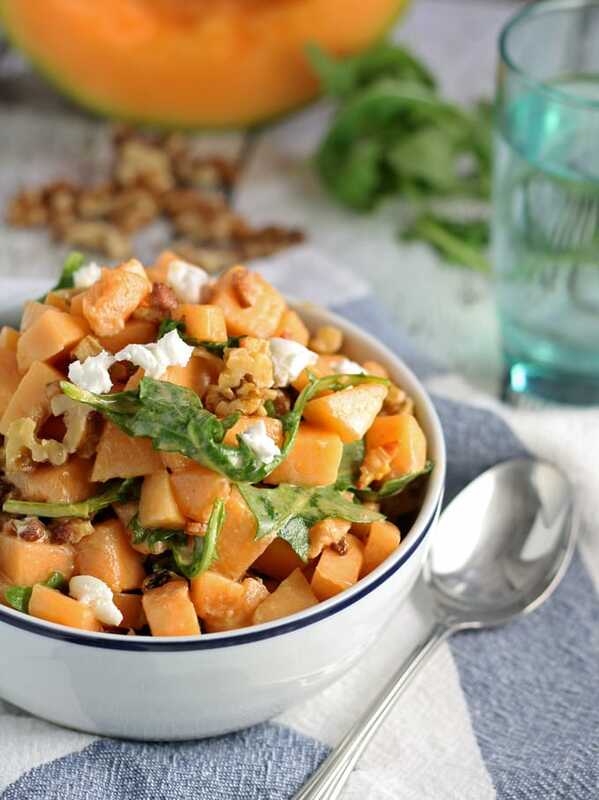 Perfect for bbqs and outdoor parties, this savory cantaloupe salad brings a taste of summer to any meal or table. I don’t know if you’ve heard, but… I’m a food blogger. We are a crazy bunch, us food bloggers. Most of us work our booties off for little-to-no money, just in hopes that someone will pin the newest recipe. Or tweet about it. Or post about it on Facebook. Some of us make big bucks (not one of that some… yet…) and others work for free samples or ingredients. Like this big box of melon I received a few weeks. I love cantaloupe so I was kind of in heaven with my box arrived. What does one do with a box of cantaloupe? I ate a few as is, because it was delicious and I love how sweet and juicy they get when they’re ripe. Then I had to get to creating some recipes. Most were duds, but the one standout, excellent recipe was this one for a savory cantaloupe salad. I don’t know if you realized but I like easy recipes that aren’t going to intimidate cooks in the kitchen. Most salads fit into that category perfectly! When I think of ways to eat cantaloupe, I imagine it wrapped with prosciutto or paired with mozzarella so I used these two ingredients as my guide. I started with chunks of cantaloupe and then added some cooked, cooled down pancetta. I’m on a pork belly kick so pancetta seemed the natural choice. Then I added two of my most recent go-to ingredients – goat cheese and arugula. Throw in a handful of walnuts for crunch and a light dressing, and you’re ready to go. This salad would be a great side salad for outdoor barbecues. 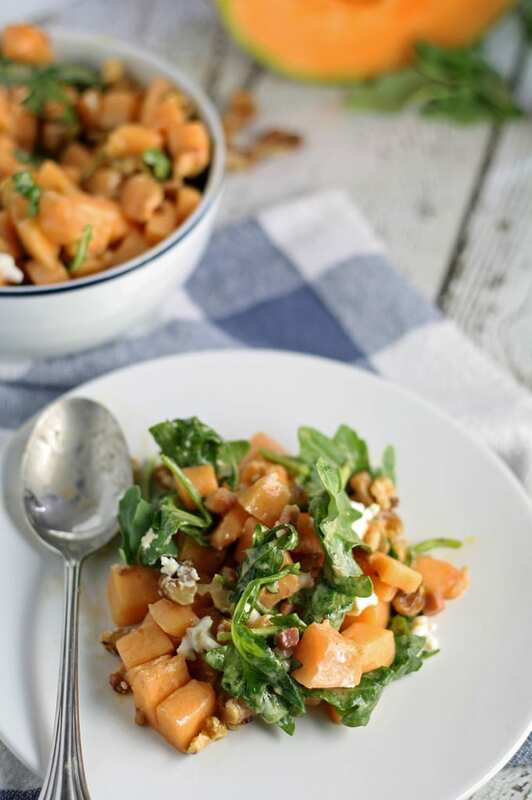 Its savory elements compliment the sweet cantaloupe without overpowering them. Serving suggestion: use a slotted spoon. The cantaloupe macerates slightly when mixing and this causes it to be pretty juicy, especially if your cantaloupe is very ripe. As a side salad, it may make its way to a plate with other food – the slotted spoon will help eliminate food/juice contamination. That’s a thing, I swear. In a medium bowl, combine all ingredients until well-mixed. Cover and refrigerate for 1 hour before serving. Jenny, what a lovely combination of flavors and textures! I’m going to remember this for when I get my hands on some cantaloupes! I absolutely love the flavor combo you have going on here! Cantaloupe is so good in savory applications. This looks fabulous! I love the savory tack that you took. 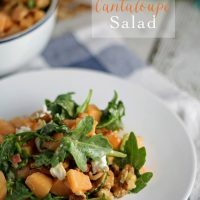 I’ve often used dried fruit or even grapes in savory salads, but cantaloupe is a new one for me in a savory salad. I hope you enjoy it Laura! This is such a great idea! I am always on the lookout for a new salad that will blow my MIL’s mind! This is going to do the trick!! Thanks Jennifer! I hope your MIL likes it! I’ve never had anything like this! How tasty! This looks really yummy! I’ve never had cantaloupe in a savory dish before, but I bet this delicious! Thanks so much for sharing with us at the Merry Monday link party! See you next week! Thanks Ashley! See you next week! It’s a pretty salad! We are so glad you shared with us at Merry Monday. I hope to see you at the new party beginning tonight at 9pm EST. 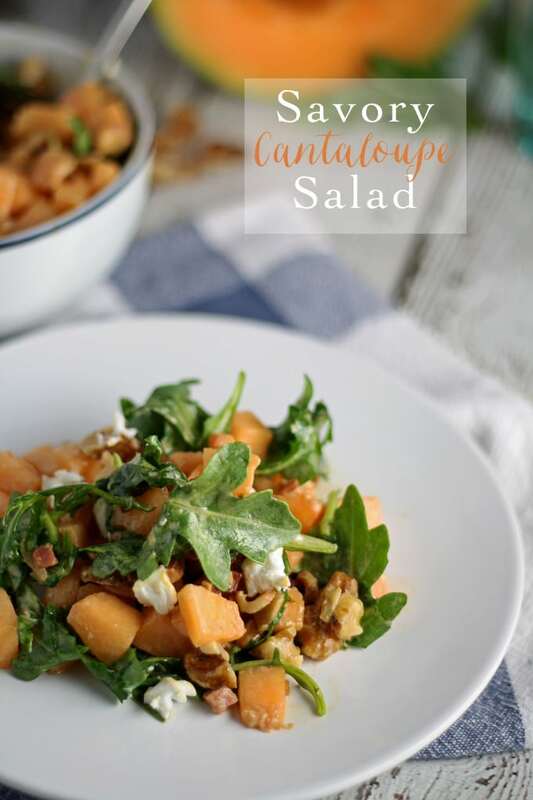 I love cantaloupe and this savory salad with the pancetta and goat cheese sounds incredible1. Pinning and can’t wait to try. This recipe will be one of my features tomorrow at What’d You Do This Weekend? I hope you will join us again!